Mopro is hiring for its new office in Cebu City, Philippines. Mopro is a VC-funded tech company in Orange County that builds and maintains mobile-responsive websites for small businesses all around the world (and for some companies you might know, like Cinnabon and Skechers). Mopro builds more than just websites, they provide our clients with an ever-evolving suite of digital products including Reputation Manager, Competition Tracker, Social Publisher and more — all built on their proprietary platform. They're proud to have over 7,000 clients and to have digital partnerships with companies like PepsiCo and Google. Mopro is looking forward to hearing from you! To know more about Mopro, visit http://mopro.com/ . 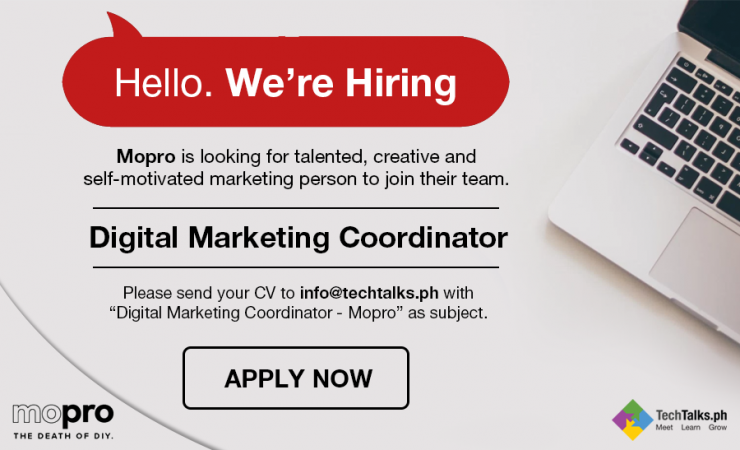 Please submit your Curriculum Vitae (CV) to info@techtalks.ph with "Digital Marketing Coordinator - Mopro" as the subject.